One of the main problems to solve with any automobile instrument or monitoring display is that the driver has to look away from the road to see the information. Also, in other cases, the driver does not look at the display, and therefore could miss an important warning such as low oil pressure. Many techniques can be used such as warning beepers or placing the instruments almost in view, but one of the most innovative is the head-up display (HUD). This was originally developed by the aircraft industry for fighter pilots; aircraft designers had similar problems in displaying up to 100 different warning devices in an aircraft cockpit. Figure 1 shows the principle of a head-up display and figure 2 shows a system in a BMW. 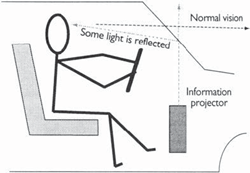 Information from a display projector is directed onto a partially reflecting ‘mirror’. The information displayed projected would therefore have to be reversed for this system. Under normal circumstances the driver would be able to see the road through the screen. The brightness of the display is adjusted to suit ambient lighting conditions. A great deal of data can be presented when this system is computer controlled. A problem, however, is which information to provide in this way. The speedometer could form part of a lower level display and a low oil pressure could cause a flash right in front of the driver. A visual warning could also be displayed when forward-facing radar detects an impending collision. 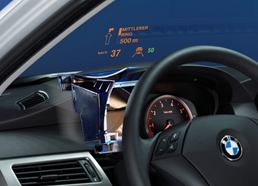 Current HUD systems are for straight-ahead vision, but liquid crystal rear view mirrors, used to dim and cut headlight glare automatically, can be used as an effective display screen for rear facing, blind spot detecting radar. One interesting study is to determine exactly where the driver is looking at any point in time, which could be used to determine where the head-up display would be projected at any particular time. The technique involves tiny video cameras, coupled to a laser beam that reflects from the cornea of the driver’s eye and can measure exactly where he or she is looking. Apart from its use in research, the eye motion detector is one of a series of tools used in bio-mechanical research that can directly monitor the physical well-being of the driver. Some of these tools could eventually be used actively to control the car or to wake up a driver who is at risk of falling asleep.